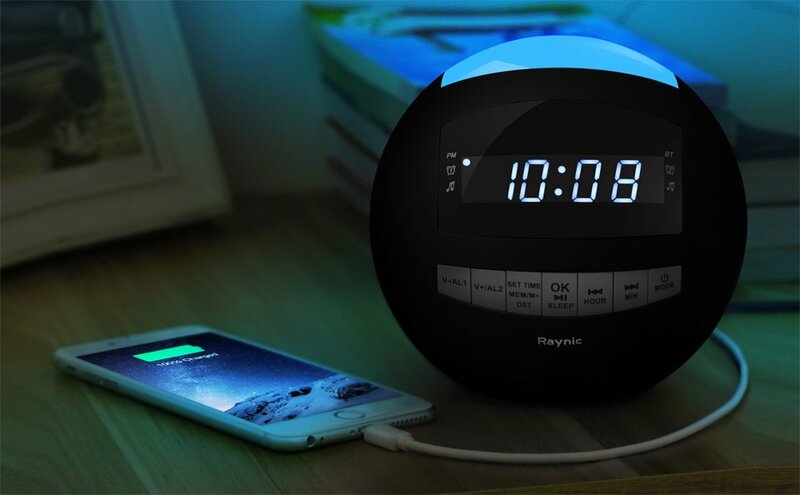 This Raynic Bluetooth Alarm Clock Radio functions as an 8-in-1 alarm clock, featuring AM/FM Radio, Dual Alarm Clocks, Wireless Bluetooth Speaker, Dual USB Charging Ports, Multi-Color LED Night Light, Snooze, Sleep Timer, AUX Input, and Hands Free Calling. It has a modern round design that sets it apart from traditional looking alarm clocks. While the design is neat, it does make it difficult to press the buttons on the front at times and you need to hold the alarm clock while pushing the buttons to keep it from moving. Instead of using a separate USB Charging adapter, the dual USB chargers on the back of the alarm clock make it easy to charge my iPhone and Apple Watch while leaving extra room in my surge protector. The Raynic Bluetooth Alarm Clock Radio has an elegant sound to wake up to each morning and it starts off low and gets louder until you turn the alarm off. The LED on the top of the alarm also lights up, which sets a nice ambience in the room. You can add 2 AA batteries to act as a battery backup in case you lose power. The alarm clock display will go off if there’s no AC power, but the AA batteries will keep the time and settings for you. You can listen to music via bluetooth audio and the sound quality is decent for a small alarm clock. Unfortunately, you can’t play audio through the USB ports, but they do offer an AUX input that you can use if you don’t want to use bluetooth. Buy the Raynic Bluetooth Alarm Clock Radio on Amazon for $39.99 with Prime.